The kings of sludge have returned after a four-year slumber, as the mighty New Orleans troupe Crowbar triumphantly release its latest 11-track endeavor. And this time, after spending most of his time supporting the latest Down project, Kirk Windstein isn't messing around. Enlisting metal all-stars Rex Brown (Pantera) and Craig Nunenmacher (BLS) to the fray of seemingly endless band member rotation, the end result of Lifesblood for the Downtrodden just may be the most staggeringly crushing outing by the band ever. 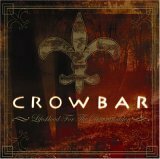 From the trademarked gloom and doom riffages of opener "New Dawn" to the uncharacteristic ballistic barrage of "Angel's Wings", Crowbar's emergence from the where are they now file is a hearty and bold homecoming for the NOLA purveyors of heavy. Anguished as ever, yet at times, like the cascading six-minute opus "Fall Back to Zero", as pristine at time as Sabbath, Crowbar's monstrous riffs, punishing rhythms, and general mammoth sonic output never sounded as necessary as Lifesblood for the Downtrodden. The soundtrack for your suffering for 2005 has arrived.